In Connection with Hindi Day Celebrations, a Hindi book exhibition was conducted in the vidyalaya library to expose all the hindi books available in the library to the students and staff members of the vidyalaya. In Connection with Hindi Fortnight celebrations, a Hindi Book Exhibition was organised on 30th September 2011 in the Vidylaya Library. A three-day Tritiya Sopan Testing Camp for Scouts and Guides will be held at Kendriya Vidyalaya, Keltron Nagar, here from Friday. A press release issued by the school here on Thursday said nearly 80 Scouts and Guides cadets and 10 officials from the Kannur and the Mangalore clusters of the Bangalore region of the Scouts and Guides would attend the camp. It would be inaugurated by T. Srirama, Assistant Commandant, Kerala Armed Police Battalion IV, here at 10 a.m. District Commissioner of the Scouts and Guides N. Suresh Babu would be present. 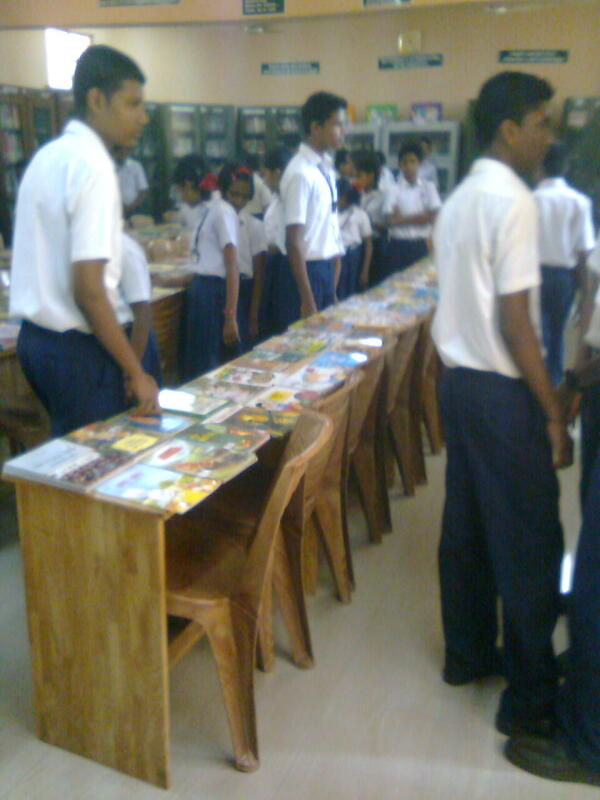 A BOOK EXHIBITION was conducted in the vidyalaya library in collatoration with DC BOOKS Kottayam on 11th and 12th August 2011. The exhibition was inaugerated by our respected Principal Shri. N. Suresh Babu at 11a.m. on 11th August 2011.Children of all classes have visited the exhibition hall and procured the books of their own choic. A number of parents have also visited the exhibition hall and acknowledged their presence by giving suggestion and purchasing good books. The teachers and other staff members of the vidyalaya have also visited the venue. A number of books for our vidyalaya library have also been selected by our faculty members. We Are conducting a book fair in our school on 11/12/august 2011. we will be bringing ideal books for the betterment of you/your protegé’s education. This includes fiction,reference,quiz books,subject books,etc.Price of the books vary from Rs.50/- to Rs.1000/-.Please avail the occasion to procure for yourselves/your protegé the best in this industry and thereby acquire more knowlegde.Please make sure that somebody from your family visit this fair. please note that the book fair is open at school timing. Expecting best co-operation from you.